China veteran protests: Is this time different? 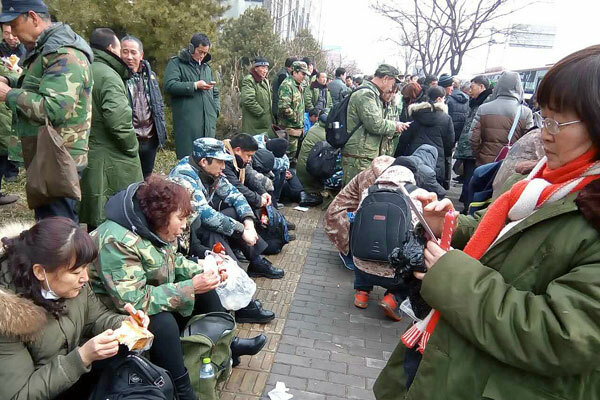 In the last few days, the news out of China that has most animated my Chinese friends — especially those with official backgrounds — is the latest protest by People’s Liberation Army (PLA) veterans. Veteran protests are not new: There was a similar protest in Luohe, Henan Province, in May, and here is a Chinese-language web page that lists various recent veteran protests. In 2016, about 1,000 veterans protested in Beijing outside the People’s Liberation Army headquarters, and in 2017, they did the same outside the offices of the Central Commission for Discipline Inspection (CCDI) — the Party’s powerful anti-corruption organization. The timing of this “legal rights defense” (维权 wéiquán, i.e., protest action) is comparatively sensitive, coming in the “summer of problems” with the China-U.S. trade war and the slowdown of the Chinese economy. In the previous two occasions that the veterans petitioned in Beijing, both sides used peaceful means, and the government did not respond with strict repression. But this time, blood has been shed. I imagine the authorities are having a dilemma: If they repress the protests strongly, they have no way to climb down. If there is any large-scale violence, it will influence the military heart of the Party, and damage the prospects of military reforms that have not yet been made. One: This time, the veterans were highly organized, nationwide. Two: Different from last year and the year before, this year, the 19th Party Congress established the Veterans Bureau. There’s a specialized government department in charge, but the problems have still not been solved. Three: The government’s strategy to counter the protests is different from the past. In the past, they would simply obstruct the protests, now they are using military strategies [兵法 bīngfǎ — in the VOA interview, he mentions the authorities giving veterans tickets to places far from the protests and other classic Communist tricks]. Four: There has been violence [流血冲突 liúxuè chōngtú]. There is one piece of footage where you can see veterans in front of the city government offices repeating their oaths of loyalty to the Party flag. This demonstrates their legality/legitimacy of their cause, and their contribution to the government. Those who yesterday maintained stability have become today’s cause of instability. The Zhao family army (赵家军 zhào jiājūn — i.e., the army of the ruling classes) of yesterday has become the enemy of today’s Zhao family. If it really comes to new soldiers attacking old soldiers, the risks are huge. Because when the new soldiers engage in combat, they may start thinking about some day in the future when they will be in the place of the veterans.